Hearts manager Grant Scott watched his team play out an eight-goal thriller in their final Scottish Women’s Premier League encounter and admitted he is determined they will return to the top-flight at the first time of asking. The Jam Tarts twice held a two-goal advantage over city rivals Hutchison Vale only to be pegged back and in the end had to settle for a share of the spoils. Hearts finished the campaign in ninth place, which in previous seasons would have been enough for the club to consolidate their position, however league reconstruction means they will now be in the second tier next term. Scott said: “I thought we dominated the game and the possession so it is frustrating that we haven’t managed to see the game out. 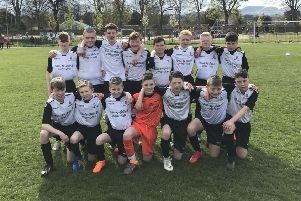 “Generally speaking when we have been winning going into the closing stages of a match we have managed the game well, but we didn’t help ourselves against Hutchie and made too many mistakes. “That said, I remain very proud of all my girls and their efforts this season. “To finish ninth from a league of 12 is fantastic for a promoted side. “In any other season that would’ve been enough to make us safe and ultimately it is league reconstruction that ensures we will be in the second tier next season. Elsewhere, Debbi McCulloch brought the curtain down on her time in charge of Spartans as her side lost 4-1 to Hibs Ladies at Albyn Park, Broxburn. Lia Tweedie (2), Kirsty Smith and Siobhan Hunter were on target for Hibs, with Katie Reilly grabbing the visitors consolation effort. Afterwards an emotional McCulloch commented: “We started well and put them under pressure but you need to retain the ball against a team like Hibs because if you give them possession like we did, then they will always punish you. “Yet, I couldn’t fault the girls’ efforts.